3. Optimistic buyers are misreading the market. Up till now, I’ve been taking demand for property in China, whether from residents or investors, as a given. Buyers know what they want — the only question is how much they’re willing to pay, or whether the government will somehow get in their way. But as the words of the young buyer quoted earlier suggest — “I can’t see [prices] falling by much more” — expectations about the future play a vital role in shaping present demand. When we invest in stocks and bonds, the supply of these “goods” is relatively fixed. There are only so many shares of Microsoft out there, and that number doesn’t change very frequently. Yet the price of Microsoft shares changes every day, because demand for those shares keeps hopping up and down, based on constantly changing investor beliefs about what the company’s future performance will look like and — perhaps just as crucially — what they think other investors are thinking and would be willing to pay. For other, more functional products like hamburgers, socks, or refrigerators, demand arises mainly from our own practical needs and varies only gradually over time, based on evolving consumer preferences, perhaps, or how the economy affects people’s incomes. Swings in supply — a sudden shortage of a critical raw material, for instance — can also affect markets, but by and large, prices tend to be a lot less volatile than for stocks. Certain kinds of products — commodities like oil or copper, as well as real estate — are hybrids: they have an immediate practical use, but are also widely used as speculative investments, bought in the hope that someone else will be willing to pay more for it in the future. (For many people, their home is both). As a result, both supply and demand tend to move around and interact in complex ways, as buyers and sellers try to meet current needs and anticipate what the future may hold. Guess wrong, and the deal that made perfect sense today could be the cause of much regret tomorrow. The typical homebuyer assumes the future will look much like the past. Usually, they’re just preoccupied with finding a decent place to live at a price they can at least stretch to afford. Even if they’re purchasing an investment property, they rarely have the time or the training to step back and assess the larger forces of supply and demand that could potentially reshape the market. As we have seen, one theory that could explain the latest reported rebound in China property sales is that developers are offering lower prices, which are succeeding in attracting more buyers. Alternatively, I discussed the possibility that even the perceived loosening of government “cooling measures” has led investors to shift their focus away from peripheral markets back to more prominent cities they had temporarily shied away from. In either instance, Chinese buyers believe they are getting a relatively attractive deal, based on their past impressions and experience. The critical question is whether they are correct, or are they misjudging the true state of the market? If they are right, what we are seeing may be the market “bottoming out” and starting to recover. If they are wrong, the rally will burn out and China’s property market will resume its downward slide. This phenomenon, called a “dead cat bounce” (or, less colorfully, a “bear market rally”) is a common feature of bubbles when they burst. Investors long accustomed to consistently rising prices see any substantial price decline as a buying opportunity. Unfortunately for them, their confidence proves ill-founded, either because their view is discredited or simply because not enough potential buyers share their enthusiasm. The chart below shows the Dow Jones Industrial Average before and after the 1929 stock market crash. In the first two weeks after Black Monday and Tuesday (October 29-30) the market lost 48% of its value. Then it began a striking recovery in which it regained 52% of the ground it had lost, before peaking on April 17, 1930. It fell, then temporarily stabilized again in mid-1930 before beginning a long, steady decline — still punctuated, however, by numerous smaller rallies. By the time the market truly reached bottom on July 8, 1932, it had lost 89% of its value. The late-1929 rally, which looked for several months like a real turnaround, proved to be a false dawn. 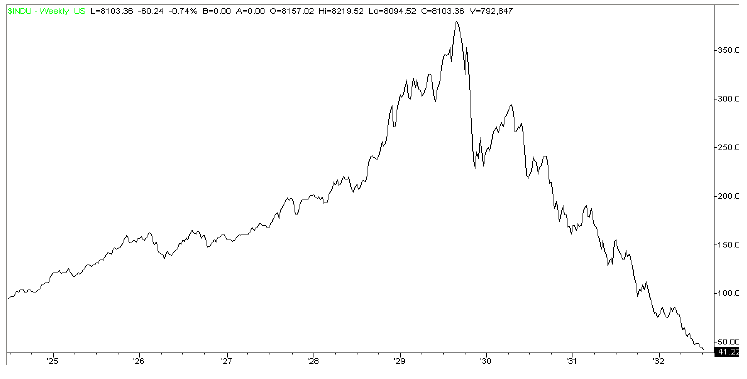 A similar “dead cat bounce” is evident in the chart below, which shows the Nikkei Index after the Japanese bubble burst in the final days of 1989. Again, the market showed a substantial recovery for several months in mid-1990 before sliding to new lows. 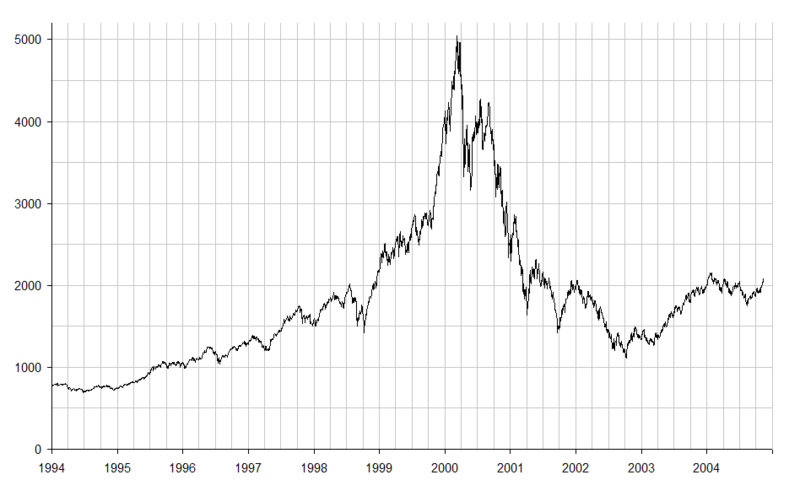 Finally, we can see the same pattern in the Nasdaq index after the Dot-com bubble burst in March 2000. The market recovered roughly half of its value later that year, peaking twice before commencing a steep collapse. Of course, such trends are only evident after the fact. If you look at the left-hand side of each chart — before the crash — you can find numerous examples of price drops that were buying opportunities. There is no way to prove conclusively that what we’ve been seeing in Chinese property is a dip in an upwards trend or a bump in a downwards one. But we can try to come to a reasonable judgment by examining what is driving supply and demand. On the supply side, we know that over the past two years, many Chinese real estate developers have accumulated very large unsold inventories, averaging in the range of 1-2 years worth of sales. We know that they have heavily leveraged themselves, by a ratio of at least 70%, in order to carry these inventories, and that as credit availability has tightened, the interest rates many developers have had to pay shadow banking sources such as trusts, private wealth management vehicles, and even loan sharks to remain liquid have spiraled upwards, often into the double digits. We also know, as I mentioned in my introduction to Part 1, that many of these debts will come due in the 2nd half of this year. All of these factors place immense pressure on developers to sell property in order to raise cash, or risk bankruptcy. As I mentioned in a previous post, “for sale” inventory is an easily manipulated number because developers and local governments get to define (or redefine) what completed or semi-completed units are “for sale.” Nationwide, the official “for sale” inventory tally amounts to little more than 3 1/2 months worth of sales, based on average monthly sales over the last 12 months, with residential inventories barely exceeding 2 1/2 months. In contrast, total floor area under construction, nationally, has risen to 4.5x the last 12 months sales, up from 3.1x in June 2010 and 3.7x in June 2011. For residential floor space, the ratio is 3.9x, for office it’s 7.7x, for retail it’s 6.7x. Assuming a three-year construction cycle, that suggests about a year’s worth of excess housing inventory, five years’ worth of excess office space, and four years’ worth of excess retail space lurking within the pipeline. And all of those numbers are growing, not shrinking. One could debate endlessly what portion of this construction pipeline is at what stage of completion, and how much is actually available for sale. Some argue that many projects are “a nail away from completion” in order to hide the true extent of developers’ unsold inventory. Others point out that the “under construction” figure includes projects where only a cursory amount of work has been done to avoid surrendering idle land, as well as other projects that have been suspended or abandoned. In fact, this debate is really beside the point. Every single square meter under construction — whatever its stage of completion — represents capital that is locked up and not generating any cash return until a sale takes place. Most of that capital is borrowed, some of it at very high interest rates, placing a heavy financial burden on developers. The four largest developers in Xinyi, in eastern China, recently found out what happens when you borrow lots of money and pour it into assets that don’t produce cash quickly enough: they went bankrupt. One of them funded its land purchases by borrowing at monthly interest rates as high at 6% (>100%/year). Even at more reasonable rates, property development is always a race against time. With time running against them, Chinese developers hard-pressed to sell. The thing that could save them is if enough Chinese are equally hard-pressed to buy. The question is whether there is enough underlying demand to absorb all the supply developers have built up, at an investment growth rate exceeding 30% per year. The main drivers of growth in demand for housing, which accounts for roughly 80% of property sales, are urbanization and rising incomes. (The main drivers for office and commercial demand, which make up the other 20%, are business expansion and performance, for which GDP growth provides a decent proxy). The Economist Intelligence Unit (EIU) in Beijing predicts that China’s urban population will expand by 26% or 160 million people by 2020, at a compounded rate of 2% per annum. I don’t think this ongoing rural-urban migration can be taken as a demographic given — it depends on continued productivity gains in China’s urban and rural economies — but based on historical trends, it certainly appears likely. The larger point is, I agree there is no physical overstock of housing in China. In Dubai, if you built it and they do not come, you have a desert with nobody there. In China, there are 1.3 billion people who would be happy to move into as nice a place as possible — if the price is right. Saying that there is great need for housing is not the same thing as saying there is strong demand for the kind of housing that is being built, at the price that is being asked. The crucial element, then, is rising incomes. How much is the typical Chinese household willing and able to afford? A national price-to-income ratio of 7.4 in 2011 — calculated by E-House based on official statistics — suggests that current housing prices pose a bit of a stretch for the average Chinese buyer, a view confirmed by the latest Q2 PBOC survey, in which 68.5% of respondents said they considered current house prices unacceptably high. That stretch is even more challenging in top-tier cities sporting price-to-income ratios in the low to mid teens: Beijing at 11.6, Shanghai at 12.4, Shenzhen at 15.6. Nevertheless, it’s possible to envision that rapidly rising incomes could make prevailing prices — if they don’t keep rising — more affordable in years to come. According to China’s National Statistics Bureau (NBS), in the first half of this year, per capita disposal income of urban households grew by 13.3% in nominal terms, 9.7% in real terms, compared to the same period last year. EIU expects it to continue rising, in real terms, by 9.8% a year, expanding 2.6-fold by 2020. I would question whether at 3.6% deflator is sufficient to adjust for the rapid rise in cost of living most Chinese have experienced these past few years, particularly in housing and food. I would argue that much of the wage gains we’ve seen at the lower end of China’s income spectrum have been inflationary in nature, driven by money creation channeled largely into construction (of infrastructure as well as property) which bid up the price of low-skill labor in competition with export industries. Others would argue that the official statistics understate a large amount of “hidden” income concentrated mainly among high-income earners. As we shall see, both of these factors — below average real income gains on the low end and unrecognized gains on the high end — contribute to a potentially hazardous imbalance in China’s property market. Even if we simply could take 9.8% real income growth per year, and compound it with 2.0% urban population growth, it would give us a market growing at 12.0% per annum in real terms (15.7% in nominal terms). The thing is, China’s real estate market has been growing a lot faster than that. Sales grew by 75% (nominal) in 2009, 18.3% in 2010, and 24.1% YoY in the first half of 2011, before the market went into contraction. The explanation for this additional demand is simple: investment. In recent years, Chinese investors — some wealthy, some not-so-wealthy — have purchased a great deal of vacant property as a form of savings, partly due to a lack of good alternatives, partly in anticipation of future growth in real homebuying demand due to urbanization and rising incomes. CLSA, based on regular surveys of project sales managers, says that investors have never accounted for more than 22% of sales, and accounted for just 9% in June (with 37% upgrading and 54% first-time buyers). I think these salesmen either don’t know what they’re talking about, or are pretending not to know. A recent government-sponsored research report, which I obtained courtesy of Nick Lardy of the Peterson Institute, calculates that Chinese households own an average of 1.2 homes. Assuming a home-ownership rate of 88% (according to EIU), that implies 1/3 of all home-owning families in China have invested in a second property. Recently, the Public Security Bureau (PSB) in Beijing disclosed that it counted 3.8 million empty residential units in the capital, which given there are 20 million people in Beijing, lines up rather well. The PSB later rescinded the number, saying it was all a mistake, but it was widely believed because (a) everyone in China knows plenty of people who have bought up several apartments as an investment, and (b) all it takes is eyes to see whole developments standing sold but empty, not just in “ghost cities” like Ordos, but any city in China. By anticipating future demand growth, investors effectively front-load that growth into the present. That’s great for developers, who get to sell more today, but it means that a great deal of future demand has already been provided for and priced into the market. We see this phenomenon in other markets as well. In the West, many investors want to buy into high-growth companies like Apple or Facebook. What they don’t realize is that, to the extent they’re paying a high price-to-earning (P/E) ratio, they’re paying for that growth up-front, with the benefit accruing to the present-day seller, not the new investor. Even a genuinely promising company can have an overpriced stock. The imbalance in real income growth I mentioned earlier exacerbates this phenomenon. The proceeds of inflationary money creation are channeled to favored recipients, often in the form of “hidden” income. These high income earners, in need of a place to stash their cash, pour it into property, in anticipation of future demand. The more money is created through expansive credit, the more cash they have to stash. In the meantime, the inflation that is generated boosts the nominal wages of low-skill workers, but erodes their real income growth, which is the basis for growth in future housing demand. Excessive money growth inflates the price that investors are willing to pay today, and lengthens the amount of time it will take actual homebuyers to come to afford that price. In other words, it creates a bubble. As I noted before, rising incomes mean that current housing prices will become gradually more affordable — but only if they stop rising. If the market has to depend solely on end-user demand, there is a catch-up period ahead, in which incomes gradually rise to meet anticipatory prices, and investors gradually sell their stockpiled apartments to actual residents. The only way to avoid this catch-up period would be for investors to continue fronting for future demand by expanding their holdings even further. Many believe this will happen. In fact, if you think about it, this is really the main rationale behind calls for the government to lift restrictions on multiple home purchases: only investment demand, in the form of renewed stockpiling, can save the day. But how realistic is this hope? 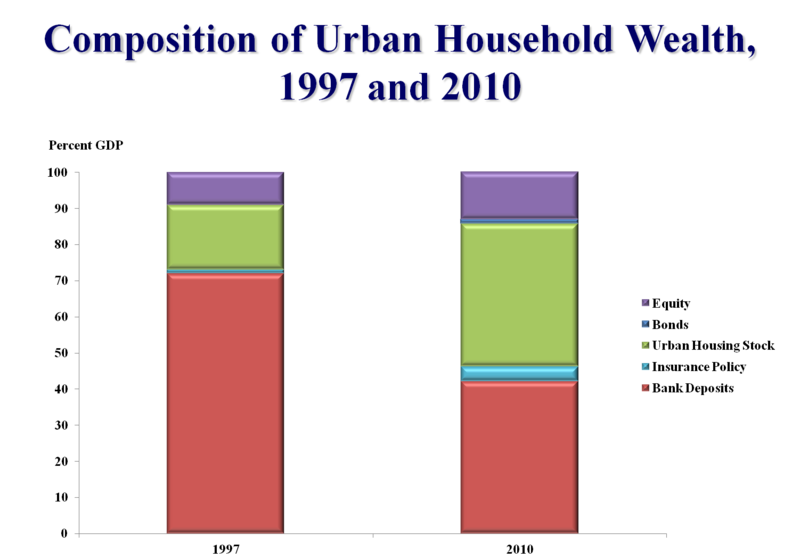 According to figures gathered by Wang Tao at UBS (and again passed along to me by Nick Lardy), urban housing stock as a percentage of Chinese household wealth has risen from 18% in 1997 to 39.5% in 2010 (Lardy’s team ran their own analysis for 2011 and come up with 41%). 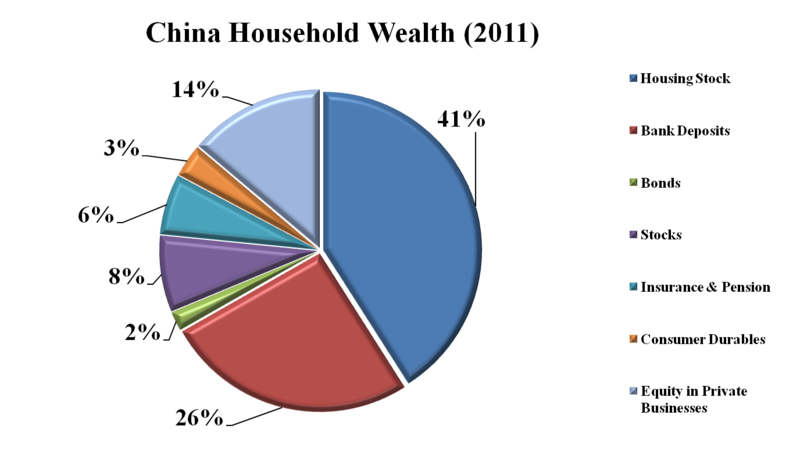 The share in the U.S. in 2011, by comparison, was 26.2%. (Both graphs below are courtesy of Nick Lardy and the Peterson Institute). In Lardy’s eyes, and mine, these figures raise serious questions as to how much more of their wealth Chinese households will be able and willing to pour into real estate. 50%? 60%? The current trends may be reaching their limits. In a recent CLSA survey (dated June 12), only 19% of middle-class Chinese families surveyed expected real estate prices to rise over the next six months, with 42% saying they would fall (an improvement over January, when only 13% expected prices to rise and 56% expected them to fall, but still a pretty negative outlook). Perhaps as a result, only 14% of consumers asked named property as their “best investment option in China” over the next 12 months, compared to 18% who said gold, 18% who said wealth management products issued by banks, and 24% who said bank deposits. Install batteries in a dead cat together with a speaker and they’ll miao all day long, no one would notice the difference… once the batteries are out, change them. Of course you’ll have to keep investing in the same cat, but at least it would go miao. I’m sure it would work on my cousin who is about 1 year old. Give him a live cat and it would go dead after awhile anyhow, some things just cannot be changed. Reality has its own rules, no matter how much we try to avoid it. Sure feels fun until that pesky ground thing shows itself. AAPL is the wrong example, it has a P/E of 13.99 and the stock is notoriously discounted by investors compared to the rest of the industry. I’m not saying either Apple or Facebook is overpriced, I’m just offering examples of the sort of high-growth company that might attract investors heedless of whether that growth has already been priced in or not. I would go with your number 1 reason of lower prices. With tw massive amount of foreclosures and short sales, it’s really hard not to try and buy. Many buyers couldn’t afford home prices 5 years ago and now is the time too buy! Thank you for an interesting series of posts. How does The Economist’s article on global house prices ( http://www.economist.com/node/21551486 ) match your analysis? This article states that China’s housing prices are a mind-boggling 32% undervalued compared to disposable income. It seems a strange combination with the the excess supply which I conclude from your articles. ‘love affair’ with land and property, despite your economic logic. Some anecdotal evidence; I recently purchased a new apartment in Guangzhou. The developer reduced the price per square meter by only 3% but the actual floor space of the apartment is 20% more than the space shown in the contract ! That may explain why the price indices are not showing much of a reduction in average prices. Your artical is crap, tell us something we don’t know of instead of wasting my time reading such a useless thing you wrote. Has the property market bottomed or not? Is it time to buy, hold or sell. These are the only thing readers are interested to know. Commenting on; ” …implies 1/3 of all home-owning families in China have invested in a second property”. Yes, this is generally true. My hairdresser living in rented space in Shanghai owns 2 properties in his hometown in Yangzhou. The second home will go to his child later. These are prudent and conservative people. They live simple lives and they put away some of their excess income in property. They are not leveraged. So, they will not be forced sellers. Very interesting blog giving the details about real estate.i did get lots of good points from here. thanks for sharing. As an investor in China residential, I always follow your views on the china real estate with great interest. I particular remember a piece that you have written on whether China property is a bubble or not (Jan 2010) Extremely well written article ( credit fuelled bubble or not) and very convincing. But now here we are, almost 3 years later: I guess it is fair to say that your bubble thesis has not worked out (or at least not yet) and if a Chinese first time home buyer would have taken your advice, he probably missed his chance to get on the ladder of homeownership. 1) Oversupply – people who believe in oversupply are making the assumption that the government has lost control over the housing sector and are not realizing that too much land supply could lead to oversupply. Housing market is key to the chinese economy – it is fair to say that if prices drop 50%,the banking sector will collapse as well, leading to a melt-down in the chinese economy. Assuming that the government are not aware of these risks is not given enough credit to the leadership who has a pretty good track record over the last 30 years. Furthermore, stories on oversupply are all anecdotal rather than based on stats – no one have done research on the actual oversupply situation and how many vacant units there are. 2) Demand – demand is driven by first time home buyers, upgrade demand, replacement demand, urbanizartion, shrinking households. In a country of 1.3bn people with limited availability and track record of statistics – any LT estimates of demand are guestimates at best. To me, the best guidance for future demand is historical demand, and chinese people are still buying apartments despite draconian HPR measures – 8mn units in 2012 have been sold. 3) Affordability – property prices in certain cities seem expensive; looking at numerous affordability metrics, China property absolutely looks like a bubble. Income to property price can reach 12x-15x in tier cities, compared to healthy levels of 4-5x. But, however, these affordability metrics have been at these elevated levels for years. So either China property has been in a property bubble the last 10 years or the affordability metrics we are using are not a good reflection of the actual affordability of the chinese. Why is discrepancy? We just do not know or have reliable data on the wealth of the Chinese or their monthly income numbers. It is a public secret that the actual income for lots of workers are higher than the reported income due to grey income; how much higher 20% or 80%. I dont know. On the wealth side – please remember in the late 90s, we have seen a massive wealth transfer when the government allowed the people to buy their existing homes for a small nominal fee- leading to a homeownership of above 80% today. These homes are worth a lot these days – and most owners are mortgage free. Many have sold these old houses and upgraded to new private residential housing, and only needed to attain 50% LTV loans – making unaffordable unit, affordable. Again, I actually dont know what the average of net worth is of Chinese person, but the level of net worth does impact affordability of housing. I personally do not know whether China property is a bubble or not because I feel that before I can answer the questions posted above – I cannot draw any conclusion. I do wonder whether you feel that you have answered the questions on demand, supply and affordability enough to have a bearish stance on China property and using terms of bubbles and irrational exuberance. No part 4 or 5? Anyhow, @williampang your point about affordability metrics is well taken. Chinese do make 50-80% more than reported, which could bring price to income down to 10x, which is not unreasonable for a place where salaries are growing at 9-10% annually. I think you have forgotten Gold and Silver.